Take a break from the gaming tables and sightseeing, and spend an afternoon at the pool and hot tub. Bring on the margaritas. And nachos. And whatever else sounds good. The pool may be inside, but the sun's outside. Grab a book and head for the loungers. Don't feel obligated to make a full dinner. Keep it simple with appies and drinks. Your peaceful home away is less than 2 miles from the action on the Strip. Overdid it last night? Reserve a spa room as part of your recovery strategy. The Bellagio fountains are a must-experience. Go see them. Pick up the token t-shirt from Planet Hollywood & Casino, just a 10 minute ride from the resort. Cleverly named for its location (at latitude 36 north), Bluegreen Vacations Club 36 is your just-off-the-Strip home away for your Vegas adventures. Its 1930’s-era Parisian Art Deco flair gives it a sophisticated vibe reminiscent of a place where F. Scott Fitzgerald and Ernest Hemingway would have hung out back in the day. And its Tropicana Avenue location lets you easily casino-hop your way around nearby Vegas mainstays like the MGM Grand, Mandalay Bay, New York, New York, Luxor and Excalibur. Taking a day off from the attractions along the Strip? The fitness center awaits if you can muster up some motivation. Head up to the fourth floor for the light-filled, year-round indoor pool area, or park yourself on a fully reclined lounger outside on the sun deck. At some point, you’ll want to kick the relaxation up a notch with a visit to Djanel Spa, an indulgent experience created by Djanel Benani, the internationally renowned therapist and skin care product designer. And if you feel like a low-key night close to home, browse the onsite shopping plaza and grab a table or pick up takeout from one of the four restaurants. There’s even video gambling if you want to save the bigger casinos for another day. Jazz Age-inspired one- and two-bedroom vacation villas range in size from just under 400 square feet all the way up to 1,400, and are well-appointed with must-haves like a washer/dryer and DVD player. Each has a compact, but fully equipped kitchen for easy homemade meals in between those famous, over-the-top Vegas buffets like Cravings at the Mirage, or Le Village at Paris Las Vegas (and the list goes on…and on). The attention to design detail is impressive, with the light fixtures and even cabinet hardware remaining true to the classic Art Deco style throughout the resort. 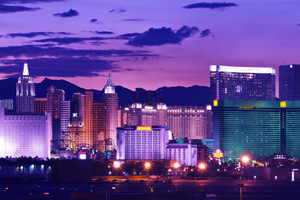 But you likely won’t be spending much time inside – you’ve got all of Sin City practically at your doorstep. Didn’t get back until the wee hours? Brilliant blackout drapes make the sunrise irrelevant, letting you snooze peacefully until noon. You could go nonstop 24/7 (as many Vegas visitors have been known to do), and still not see all the sights and spectacles, but here’s a starter list to ease you in: Bellagio fountains, Mirage volcano, King Tut’s tomb at Luxor and Mandalay Bay’s Shark Reef. Additionally, the Fremont Street Experience is a crowd-pleaser, you can’t go wrong with show tickets, and dining is a main event. Just outside the city, you’ll find 50 championship courses, like Shadow Creek and Bali Hai. And you don’t have to go too far for lake sports and state parks if you need some non-neon entertainment.